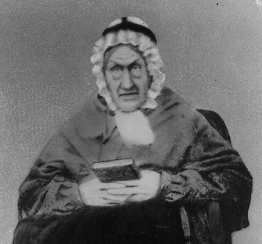 James Jackson of Glasgow, Scotland, married Isobel Thomson, also of Glasgow. James lived four miles from Glasgow, on land which he leased for 99 years as so many farmers did. He was a good farmer, as well as a prosperous farmer. He would take his farm products across the 'toll bridge' and bring back a load of fertilizer, thus saving toll, which showed his thriftiness. His three sons, James, William and Archibald and one daughter, who married a man by the name of Thomas Orr in Scotland, emigrated to America. James settled in New York and married Mary Ferguson, William married Ellen Winning and Archibald married Catherine Little. Achibald and Catherine settled on a farm four miles from Nauvoo, Illinois. Picture taken in 1937 by Jean Wikins & Lela Ferguson on trip East. 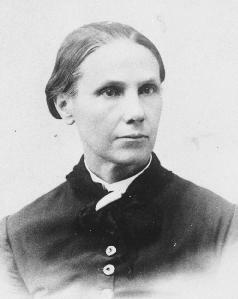 The sister, Mrs. Orr and husband come to Nauvoo and became members of the Mormon Church. Archibald Jackson told of himself going to Nauvoo at the time of the 'Mormon Rebellion', in 1847, one cold morning and standing on a hill, trying to persuade his sister and her husband to stay in Nauvoo and not go to Salt Lake in the "Mormon train'. They, however, left with the 'train' but later parted with them and the family went on into California. 'Archie' Jackson was a peace loving man and never would take sides, either for or against the Mormons. One winter day in 1847 he was out in the timber cutting firewood when a neighbor rode up hurriedly and said, "Now, Archie, the time has come for you to take a stand either for or against the Mormons." He remained firm and replied, "I will not take sides either way." When he sailed from Scotland for America in 1834, his father gave him a solid silver watch which he always kept and which is an heirloom of his daughter Isabell Quint. (Grace Gilliland, Isabell Quint's daughter in Arkansas City, Kansas, now has the watch.) His mother put a Bible in his trunk with the admonition, "Now don't leave it there." 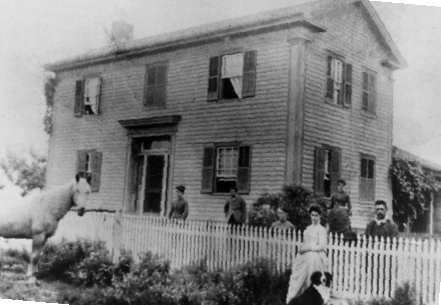 Archibald and Catherine Jackson went to housekeeping on the homestead four miles from Nauvoo, in a two room house which later was added to as the family grew and prosperity came. Grandmother lived in this home for 65 years and after the passing of her husband and seven children, came to Hill City, Kansas to live with Isabell Quint.